"¡Oye Broder, Get a Load of These Palabras!" lonchando: Having lunch. "I'm lonchando, I don't wanna talk to him now." yogur: Yogurt. "Este yogur doesn't really hit the spot when you're lonchando. Maybe I need to order a jambergue and some fries." bacunclíner: Vacuum cleaner. "¡Aye! I think the bacunclíner just swallowed my earring!" frizando: To make frozen, or freezing. "Turn up the heat, ¡estoy frizando!" Before long, you'll be ready to graduate to the next level of Spanglish, with terms like pata de puerco ("pig leg" -- a new way to call someone an idiot) and Jamón del Diablo (deviled-ham product) and phrases like "¡:Boto la casa por la ventana!" ("That rocks!") 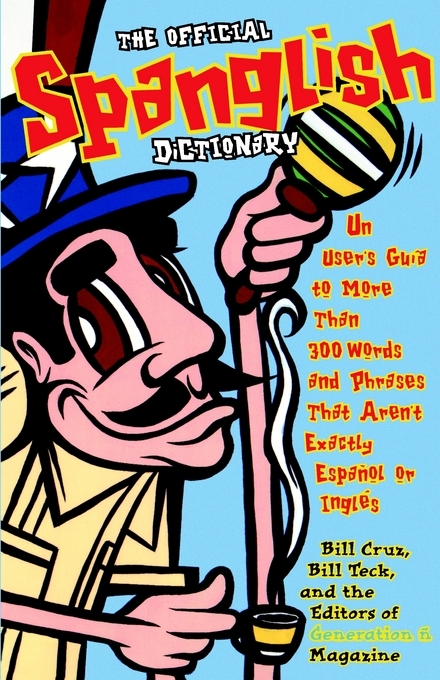 The Official Spanglish Dictionary contains hundreds of terms to guau your friends and family, plus Spanglish terms of endearment, insults, and those all-important Spanglish pickup lines: "A ti no te duelen ni los callos" ("You're so fine, even your bunions don't hurt"). Liz Balmeseda, Columnist The Miami Herald A surprising feat of spanglicity from a couple of guys named Bill. The authors take Cubonics and other crossover strains to a new level In The Official Spanglish Dictionary. It simply snores the mango.